The catchiest, funniest power pop band today. 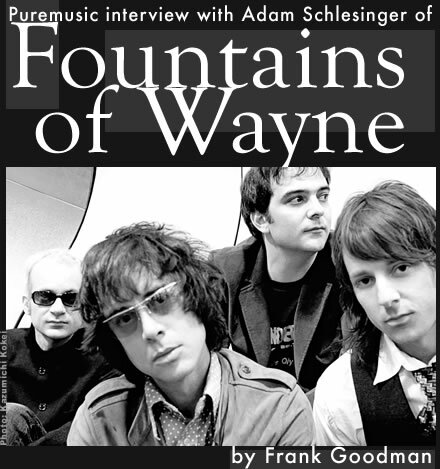 Fountains of Wayne write these three minute short stories that have fantastic grooves and great guitars, plots, characters, and melodies that stay with you through the day. Nobody does it as well as they do. The main writers are lead vocalist/guitarist Chris Collingwood and bassist and background vocalist Adam Schlesinger, whom we interview in this issue. He first came to the spotlight by landing the big musical shot with the title song for the movie That Thing You Do. He's extremely smart and focused, and took the time to be very friendly, though I'm sure he had at least 5 interviews backed up behind mine. (I like the early slot, after coffee, before the idiots burn them rotten.) Adam and I talk a little about Chris, but the other stars go unmentioned, so let me say here that they are drummer Brian Young and lead guitarist Jody Porter, formerly of The Posies and Belltower, respectively, and they’ve been in the band since the beginning. Gods be praised, FoW leaped to higher levels of stardom off the relatively huge success of the hit single "Stacy's Mom" on the last record, Welcome Interstate Managers--and the video with Rachel Hunter burning up the screen as the too-hot mom of the young girlfriend, she was extremely funny. But it's the lyrics that make it possible, because the stories are so well-crafted, perfectly twisted vignettes of messy life. A friend of mine just caught their show in SF and marveled at how cross-generational and adulational the audience was, hanging on and singing along with every word. FoW are totally hip on the one hand and family entertainment on the other; that is a very small road to be roaring down the middle of. This new record Traffic and Weather (see our review last month) is a tour de force in a brilliant career that will add thousands of fans to the ever-growing fold of one of the greatest acts touring and recording today. If you like fun pop records, you must get this CD, and it will bring you great, simple, guiltless pleasure. We love them to death, here's Adam Schlesinger of Fountains of Wayne.